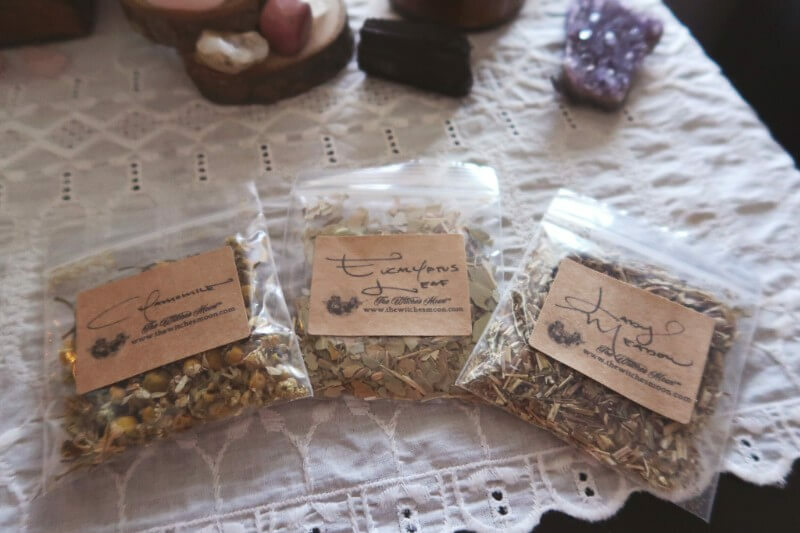 In this blog post, I’m going to share with you everything that we received in the February subscription box of The Witches Moon, a beautiful premium monthly box for witches. During the month of February, we focus on healing ourselves and those around us through the power of transformation. Situations and setbacks are only but a stagnant mindset connected to old thought patterns and negative feelings and energy. Being one with the Universe means being a child of growth and possibility. We do not allow ourselves to be defined by our past but by our aspirations for a brighter future. We focus on healing spiritual wounds and transforming ourselves into the strong beautiful beings that we are naturally created to be. My first impression: this box has an old world feel to it–not that cute/new-agey/mainstream feel that a lot of spiritual boxes have. The contents that come in this box will definitely help you in practicing your craft, keeping your tools stocks, and providing inspiration. I also love the packaging and I could tell that they took great care to pack everything inside so that it felt like opening a gift. 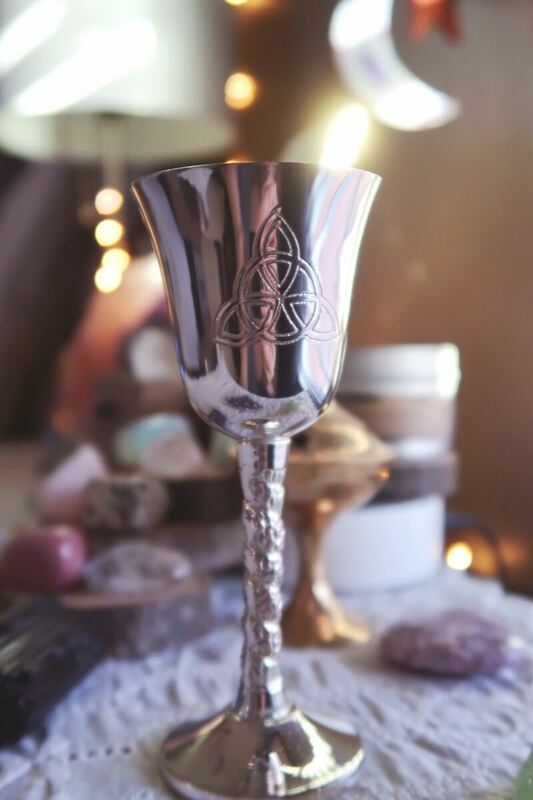 The Chalice assists us in receiving spiritual energy, giving offerings and connecting with those around us and with the Divine…The base of the Chalice represents the material world and monetary acquisition through daily life. 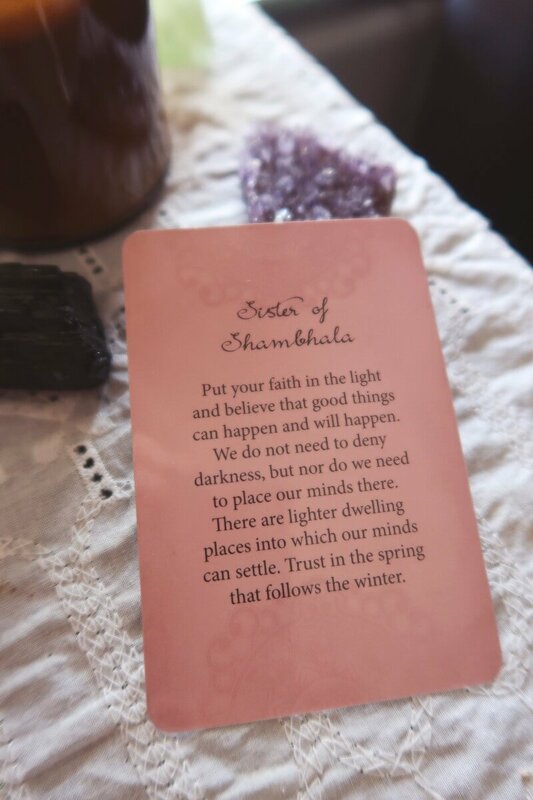 The stem of the Chalice reprints the connection between self and spirit and our journey to obtain this beautiful connection. The rim and opening of the Chalice represents the receiving of the Divine Energy. 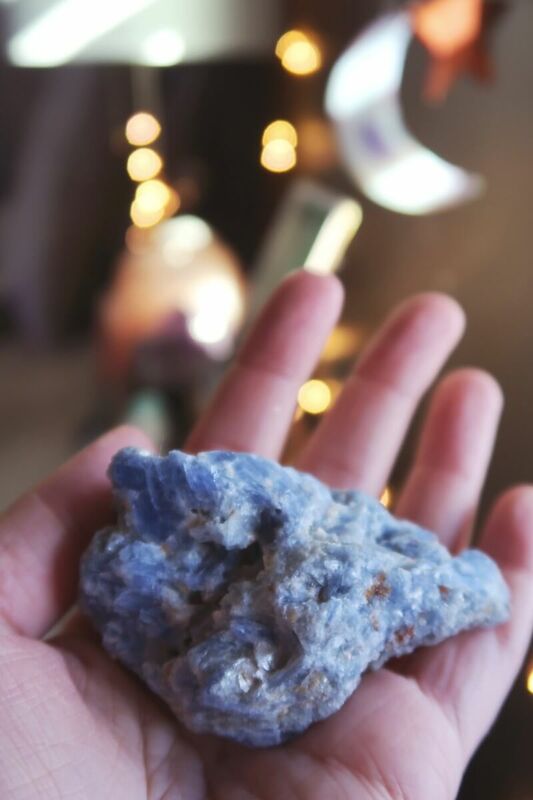 I held this big chunk of blue kyanite in my hand so you could better tell the size of it. This is the biggest gemstone I’ve received in a spiritual subscription box so I was really excited about that. One of the most powerful of the Throat Chakra stones, Blue Kyanite has been one of our favorite crystals for creating a stronger, more potent aura. Known for working with the Throat Chakra, Blue Kyanite is fantastic at helping to speak one’s truth with clarity and conviction. This makes Blue Kyanite a valuable tool while reaching spells and intentions, and can rollover to day to day life and interactions. Next in the box was this mystical pendant necklace. In days of old, the Hare was thought of as being involved in creation of the world by the Algonquin Tribe and Ancient Egyptians. Although the Hare resembles the rabbit, the differences are substantial. 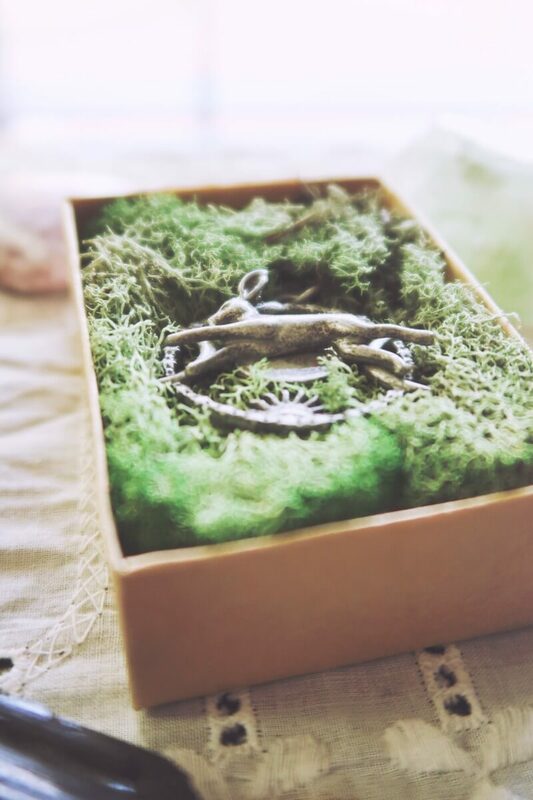 We use the Hare as a symbol of vitality, virtue, and ambition. 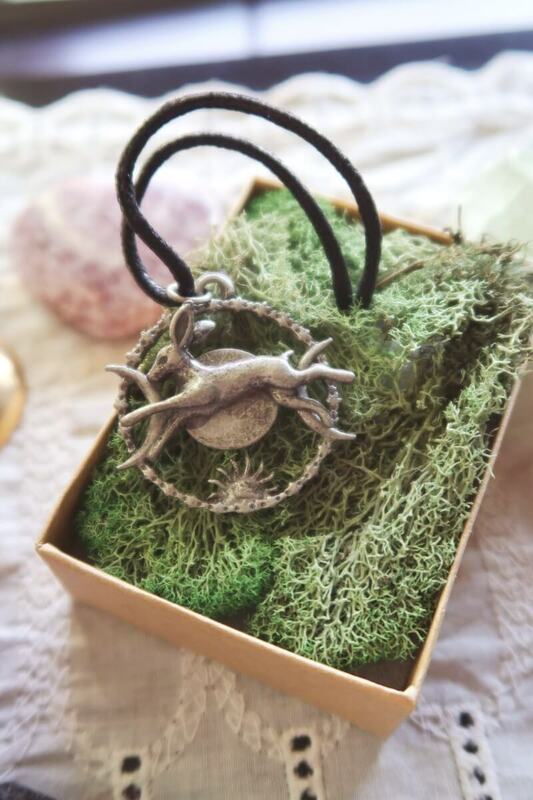 As the Hare moves around the Lunar Cycles, he aids us in recognizing the signs around us and assists us in understanding the tides of movement in our lives, daily and over time. The Hare resembles quick thinking, swiftness and is a symbol of diligence. Allow the Celestial Hare to accompany you on your journey through transformation, giving you the power to think clearly and make decisions without anxiety. I absolutely love the meaning and symbolism behind the Hare and since I have a big transition coming up in my life, I’m looking forward to wearing this pendant as a reminder to recognize the signs around me and that I’m never alone. Next was this very decent sized candle. This is a big box; I’ve been subscribed to other boxes and they’re about half the size but not really that much less expensive. This box is definitely worth it’s price. We have created this candle with the purpose of enhancing the Healing Process in your life and assisting your renewal process. This candle has been enchanted with Rosemary and Eucalyptus essential oils. 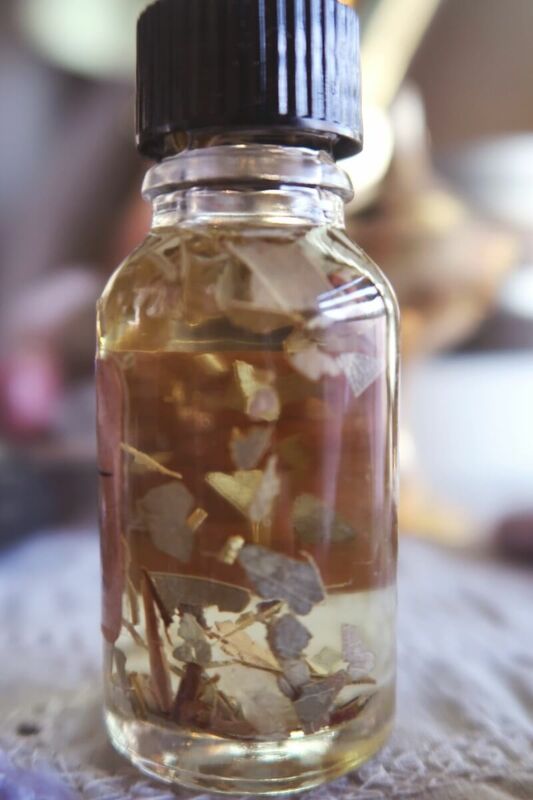 We have also included a special mixture of our Healing Magickal Oil from our Personal Cabinet of Witchery. This candle is wrapped in a spell from our Book of Shadows that we recommend reciting out loud 3-7 times while burning your candle. I am really drawn to anointing oils. If you watch me do my moon rituals on my Instagram, you’ve likely seen me use an anointing oil at the beginning and throughout my ritual. Healing, or the Latin form ‘Sanitatem’ has been a powerful word among our practice when working to mend spiritual wounds. 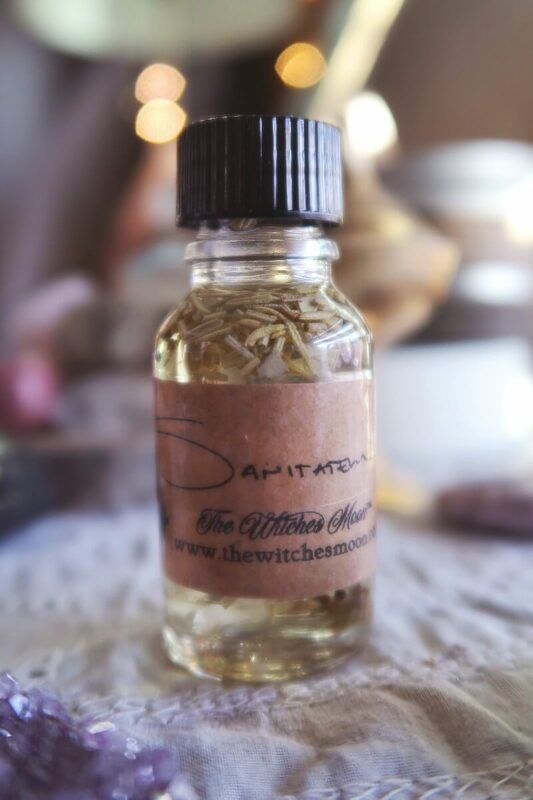 This Sanitatem Magickal Anointing Oil has been created with the intention of maximizing the healing throughout the aspects of your life. 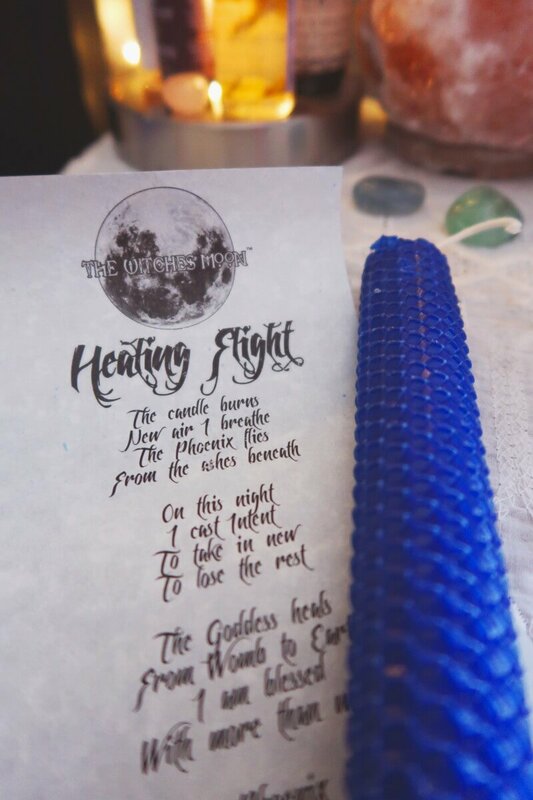 We recommend anointing candles as well as jewelry and skin (specifically the Chakras that need healing) to take full advantage of the energies within. While anointing we prefer saying aloud our intentions for doing so. This will add to the intention being charged into the items that you are anointing and adds conviction to your work. We have enchanted this Magickal Oil with Rosemary, Eucalyptus, Juniper and Sandalwood essential oils and have included Rosemary herb as well. Inside your oil you will find a Lemurian Quartz, said to personify oneness into your aura. This salt smells amazing, I wish I could accurately describe it. I can’t wait to use it in my next bath. Everything in this box is really speaking to me because of the upcoming transition I’m about to make and the clarity I’ve been wanting to manifest. Aegle, the Goddess of radiant good health was also well known for her brightness and splendor. We have created this Sacred Salt to permeate these characteristics. Relax and let go of preconceived thoughts and expectations. Allow your inner chatter to slowly stop cluttering your emotions. As you clear your mind and visualize a blue/white aura, imagine yourself charging your internal magnet and repositioning your compass. Visualize yourself becoming stronger and stronger until you have reached the strength you have set out to obtain. 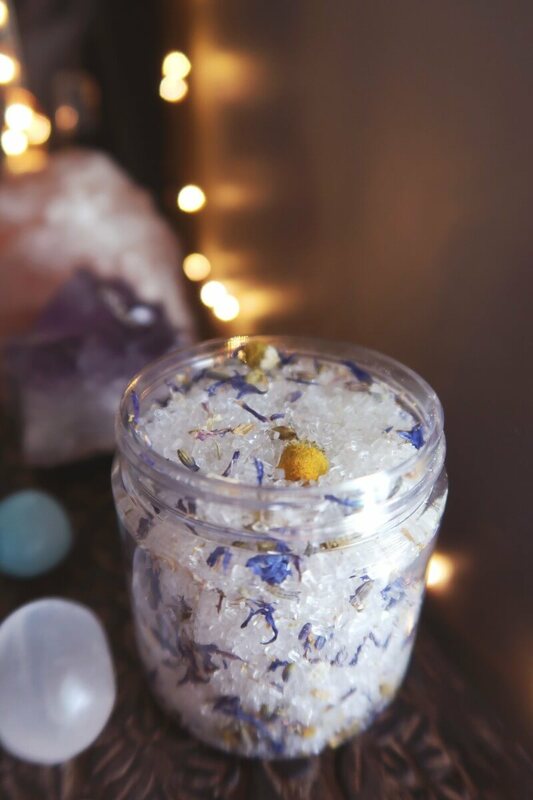 We have enchanted this Sacred Salt with rosemary and sandalwood essential oils as well as chamomile, blue cornflower and lavender herb. I have never had shasta sage before but after learning more about it, I’m really looking forward to using it. From the sacred Mount Shasta in northern California, Shasta Sage is usually found in smaller bundles as it lasts for a long time. Shasta Sage is a great healing sage and is known for bringing healing energies as well as spiritual strength. 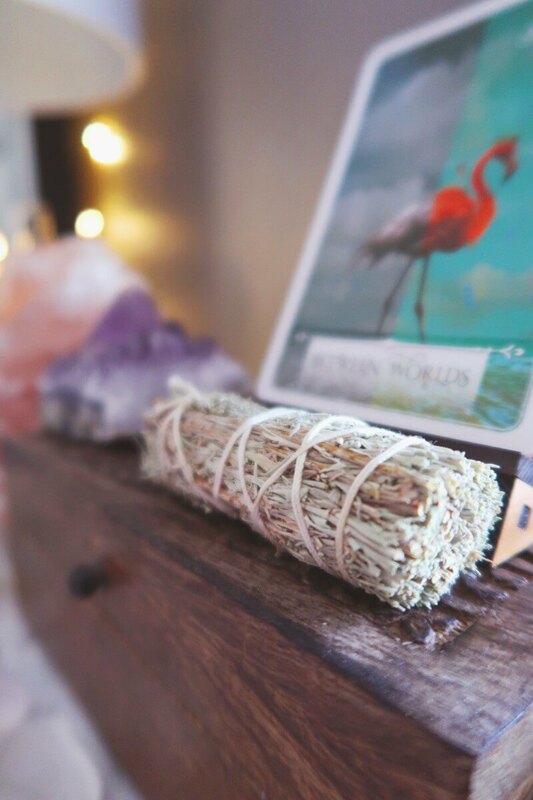 Shasta Sage is also known to enhance intuition and attract abundance while you work to transform the energies in your aura and around your sacred space. Burn Shasta Sage before and after ritual to prepare and attract the healing energies into your life. THIS was what I could smell inside my mailbox! I cannot wait to burn this incense. The scent of eucalyptus has been used in many important magickal practices. We love to use this scent as a tool to spiritually open ourselves to accept blessings. 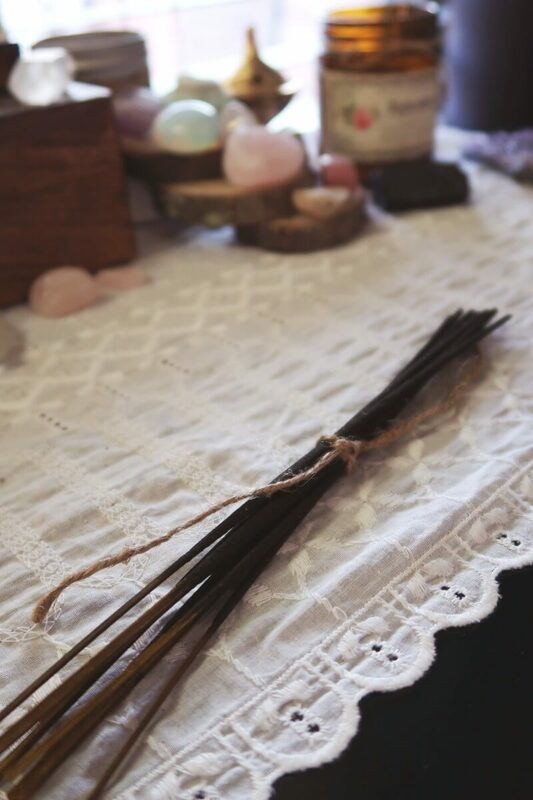 Light this incense while you soak in your ritual bath or during your mediation to unlock the potential transformation and fulfillment in the year to come. Enjoy the sweet, fresh aroma. Eucalyptus has always been a necessity in our Personal Cabinet of Witchery. The leaves of the eucalyptus plant have been long used in healing spells and sachets. Stuff a poppet with eucalyptus or carry with you to maintain vibrant health. To heal others, ring eucalyptus around a green candle and burn through, visualizing the persons becoming completely healthy and renewed. The leaf of eucalyptus is also great to burn in an offering bowl to promote healing energies during ritual. When working to combat negative energy, curses or spells, chamomile is our go to herb. Sprinkle chamomile around your house to remove curses and spells that have been cast against you. Steep in tea and brews to relax and calm the nerves. Chamomile is also a great assister during sleep to maintain healthy dreams and relaxation throughout the night. ‘Lady Meadow’ or Meadowsweet has proven to be a beautifully happy herb. The scent of the meadowsweet cheers the heart and brings peace in your space. Commonly used in Love Spells, meadowsweet is a great attracter of happiness and love. 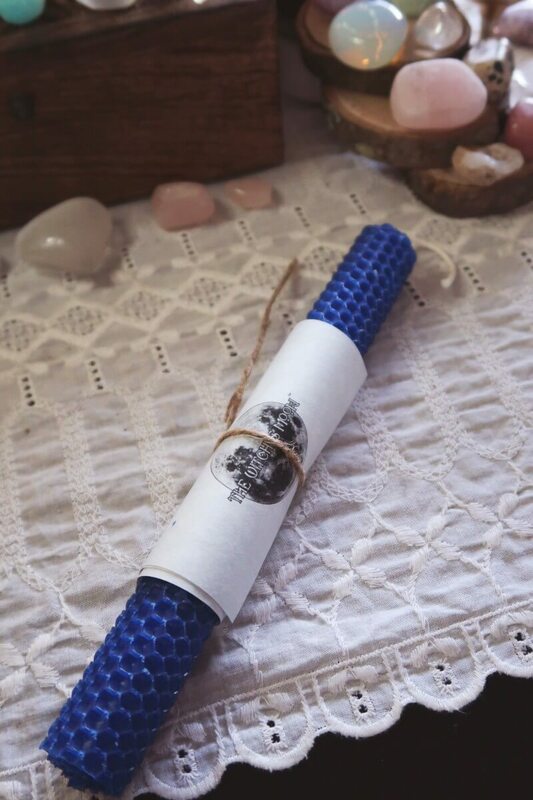 Add Lady Meadow to your ritual to bring about the energies of healing and love so that your intentions may maintain purity. I can’t tell you how meaningful this oracle card was for me. As I’ve mentioned, I’m about to experience a big transition in my life, and I’ve been so worried about all that could go wrong. The part of this card that says to remember that good things can and will happen is something I want to be reminded of frequently. I thought this was such a beautiful touch. 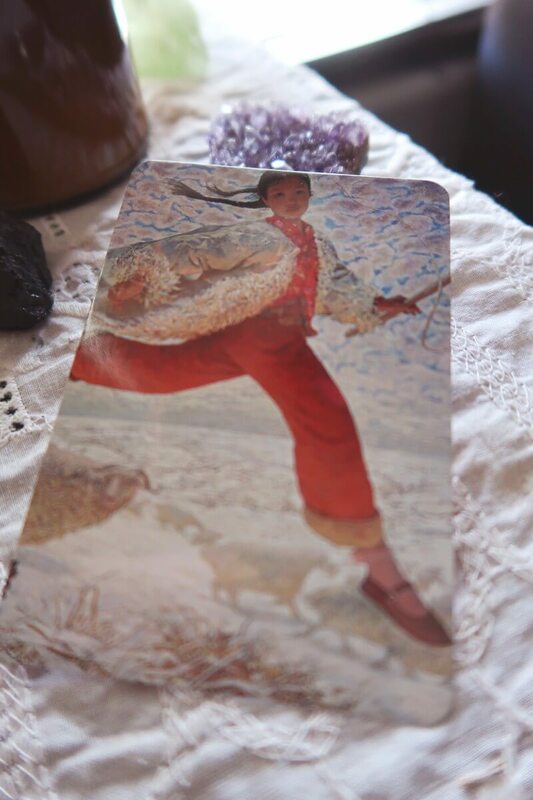 We have meditated and selected a card from the Wild Kuan Yin by Toni Alana Fairchild to place inside your box. This card and the saying that it holds was meant for you. Take the time to reflect on the wisdom that it holds. let it resonate with you and speak to the pressing realities in your world. Not pictured but along with the parchment paper description insert above is a blank sheet. We believe that writing down your intentions and goals pushes you further in accomplishing them. 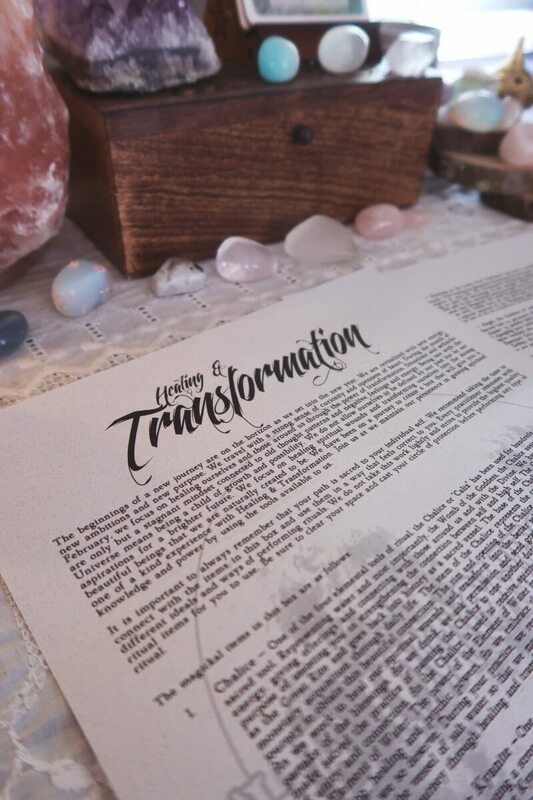 We have added a piece of parchment for you to write down your intentions before your ritual so that you may add it to your own personal Book of Shadows. How beautiful is this artwork? I am definitely planning on creating a grimoire very soon. I’ve never enjoyed being crafty so pieces of artwork like this will be what livens mine up. We have partnered with a very talented local artist to create an exclusive hand painted piece of artwork to honor Ostara. 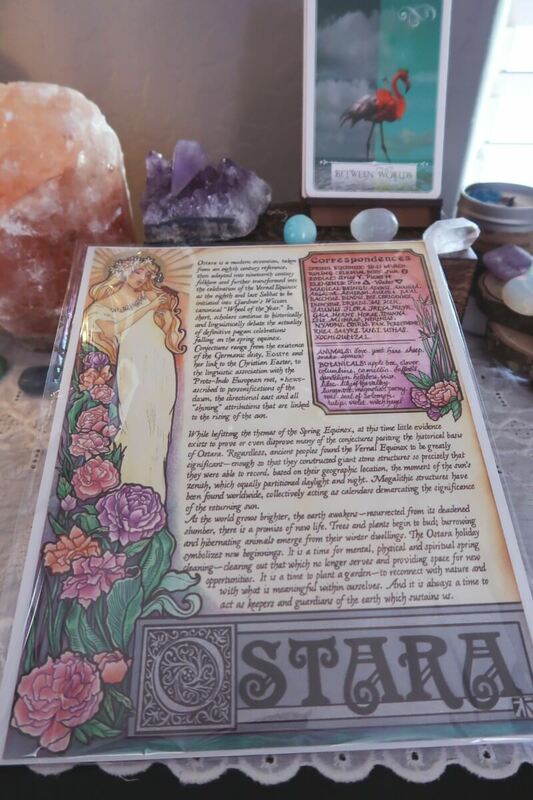 Add this beautiful artwork to your Book of Shadows or place on your altar for display. Artwork by Adrienne Alden. My final impression: this box is put together with a lot of thought and intention behind it. I haven’t seen such a detailed and descriptive insert as this one. All of the items in the box flowed together. I feel like they sent something for every aspect that most boxes can’t offer because they don’t send as much. I received altar tools, a bath product, something I can wear, a big crystal, herbs, an oil, candle, items for my grimoire, and incense. That’s a lot in one box. As you perform your ritual, do not set expectations. Cast your intention and be of pure heart and mind. These very personal moments are for you. There is so much knowledge available to you. Take pleasure in knowing that you are becoming one with the Earth, Stars and Universe. Open yourself up to receive these beautiful gifts. We urge you to stay curious and hungry for knowledge. We are set free by the beautiful world around us. We send you Love & Light as you delve into the comfort of the healing process and work towards spiritual transformation. I hope you enjoyed this post. 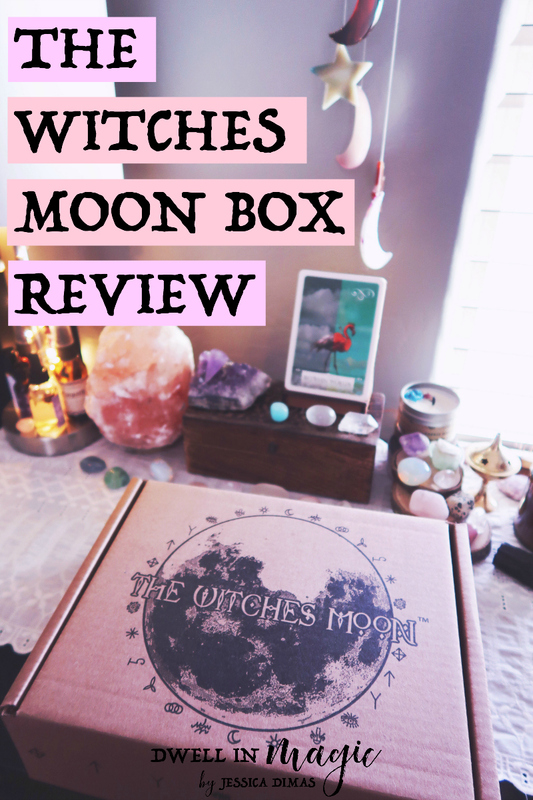 Have you received The Witches Moon Box and if so, what are your thoughts on it? 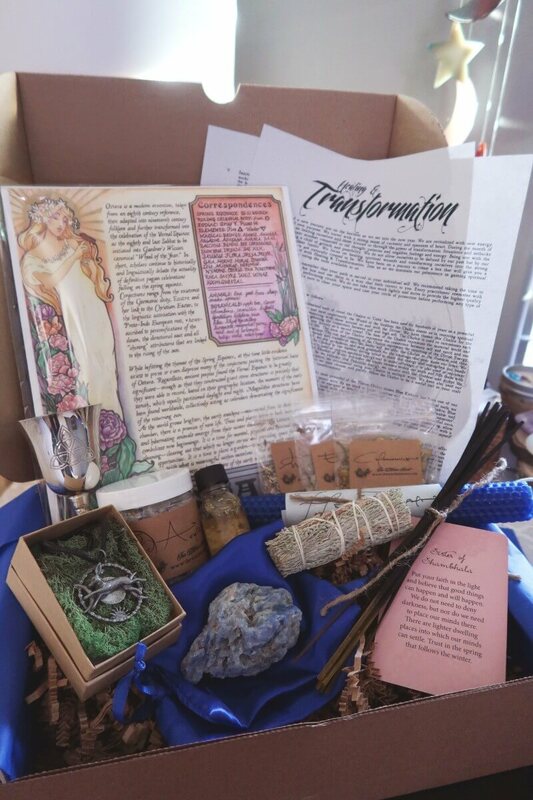 For my complete round up of the best witchy boxes out there, click here to read that post. For free spiritual self-care resources and gifts, sign up for the Dwell in Magic weekly newsletter. If you’d like more ritual inspiration, connect with me on Instagram where I share parts of mine on Insta stories. 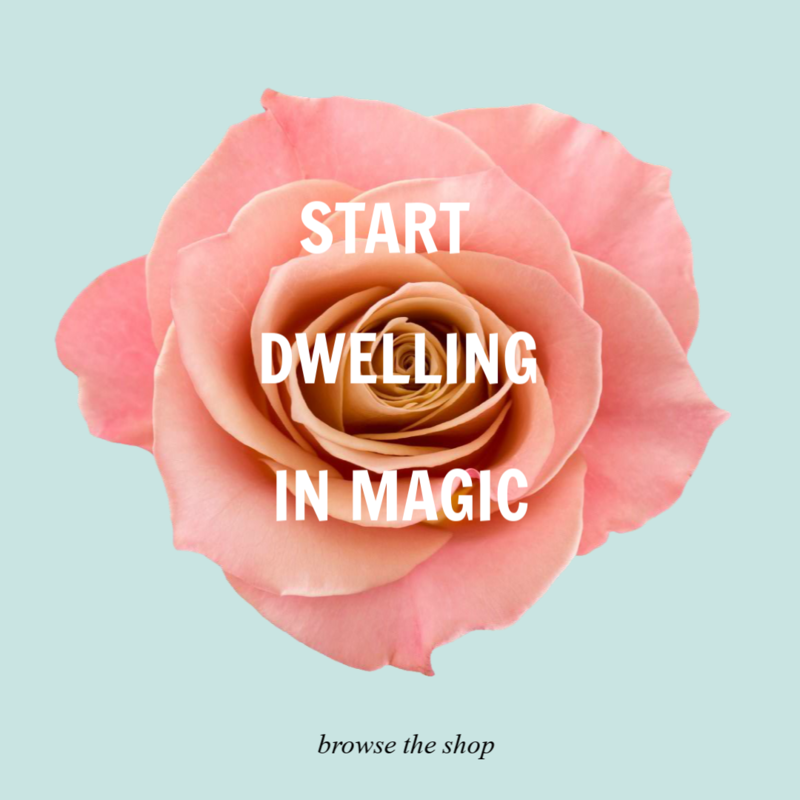 If you’d like more direct support and community with like-minded people, come join the Dwell in Magic Facebook group, where we discuss self-care every Sunday.